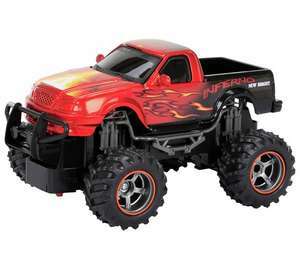 1:24 R/C Full Function Predator truck. Track those predators with this off-road t-rex truck. Dinosaurs and predators stand no chance once you are on their trail with its full functional radio control. I bought a bright RC car from tesco in the half price toy event, it looked great but felt cheap and flimsy and the build quality with the electronics and controller was quite shoddy. Basically the signal came and went even up close and the steering was temperamental and jittery. I love RC cars but did not enjoy thie experience of this one. Ended up taking it back as I didn't want the boy to play with a toy that did not function as intended. I bought a bright RC car from tesco in the half price toy event, it …I bought a bright RC car from tesco in the half price toy event, it looked great but felt cheap and flimsy and the build quality with the electronics and controller was quite shoddy. Basically the signal came and went even up close and the steering was temperamental and jittery. I love RC cars but did not enjoy thie experience of this one. Ended up taking it back as I didn't want the boy to play with a toy that did not function as intended. This is true of all New Bright RC cars. They are so flimsy its shocking. Bought a monster truck from Tesco last Xmas. At first wasn't too bad kid and myself enjoyed playing with it.....but it stopped working after a few weeks of non use. Regretted not keeping the reciept. If you do buy it scan, copy or buy online so that you easily show proof of purchase. Have to agree with the other comments. New Bright stuff seems to be made as cheaply as possible with no thought going into quality or fun. Yes they look good, but unfortunately, that’s it from my experience. Pay a bit extra for a brand like Nikko, good value for money and built to last a lot longer. Not voting based on this. Definitely not buying! Anyone heard of wl toys? There seems to be a lot of China's made rc', own brand stuff.